Do you scheduled lots of posts on WordPress? Do you then find yourself posting an immediate post 10 seconds before a scheduled post is going live? Do you kick yourself for ending up with two posts so close together? If yes to all three, then my plugin may help. Scheduled Planner is an admin plugin which appears in the Add New / Edit Post section of WordPress. At the moment it just rests in the top right as I’ve yet to work out how to make it in to a nice widget. 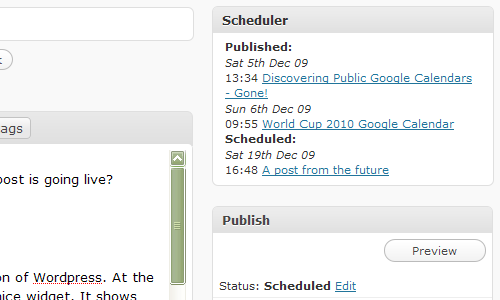 It shows the last two posts published on your blog, and then all the scheduled posts. Allowing you to work out if it is safe to hit Publish or if you should schedule this post for 3 hours time. Tested on 2.8 and 2.9.